This comicbook is great! 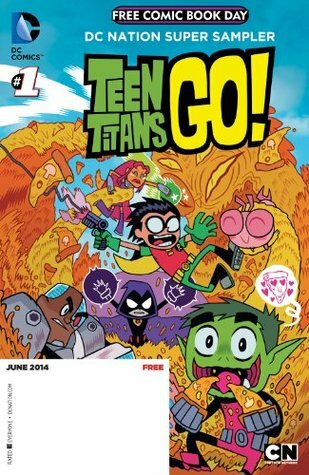 It's free too!This new Teen Titans comic captures the manic energy of the original cartoon it shares a title and the wholesome fun of Tiny Titans by Art and Franco. A cute, fast read, this was a nice little comic with adorable graphics. Like the show it is geared toward younger kids. Though not as great as the original show, the characters stay true to their strong personalities. The reason I read this comic was because my boyfriend presented me with a selection of comics he'd picked up as part of Free Comic Book Day and I was instantly drawn to this one. The cute, bright, zany artwork was exactly my cup of tea and the story was girly and fun, with a few elements of humour adding a giggle or two to the read. In short, it's free and entertaining, what is there to complain about? Picked this up on Free Comic Book Day because Teen Titans are so much fun. I love their new look. Haven't watched the show but I loved the comic. I would totally read more of these!! This FCBD issue was a nice sampling tothis alternative take on DC's stable of teen heroes. It comes off as a fun combo of classic '90s Cartoon Network (some definite Craig McCracken influence in the art) and the gag-focused webcomic genre. Plus, you get to see Riddler as a mini-golf course manager--if the series keeps up these kinds of fun cameos, it might just be worth checking out. I thought both stories were funny. The first had the Titans trying to figure out who has been stealing Cyborg's sandwich. While the second story had the Titans playing miniature golf with Beast Boy and Robin trying to settle a bet. There were some funny moments in this, I think it's a good comic for kids.